Organisations depend on their network and security devices to perform as expected to ensure regulatory obligations to many current standards including Sarbanes Oxley, HIPPA and Gram Leech Bliley. The only way to ensure compliance is through the active validation of each device and the network/security solution as a whole. 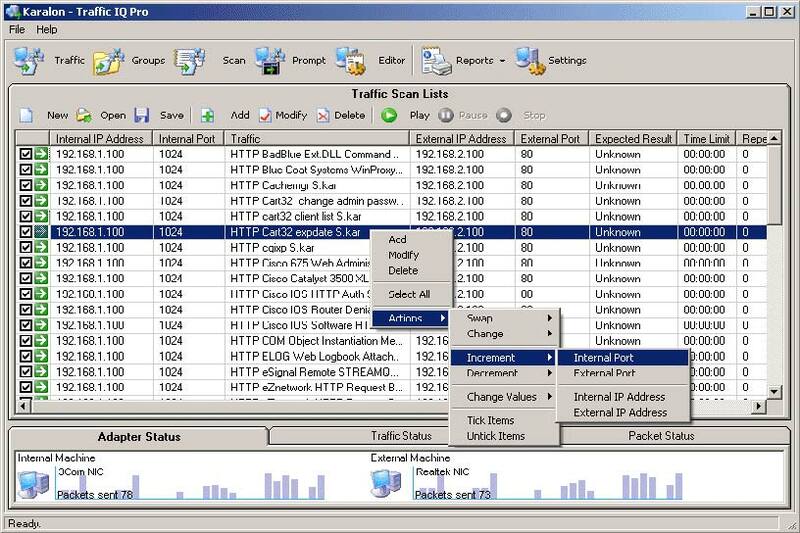 Traffic IQ Pro™ has been carefully designed to be the only tool you will need to validate traffic flow through or over network based packet filtering devices by allowing users to quickly, easily and statefully validate using a library of pre-defined and periodically updated network traffic files. Using the extensive and varied library of hundreds of traffic files and two network cards, the application creates multiple virtual machines negating the need for any additional hardware or software therefore reducing overall costs associated with extended setup times and hardware procurements. Enabling such a wide range of testing scenarios makes Traffic IQ Pro™ an ideal solution for network and security administrators, auditors, consultants and vendors alike. Traffic IQ Pro™ is currently the preferred tool of choice used by many leading testing labs, centres of excellence and training organisations and is currently under review by a number of leading security organisations as the tool to standardise the validation of security products reducing the overall time required during the assessment phase of any procurement.